What Day Of The Week Is September 4? 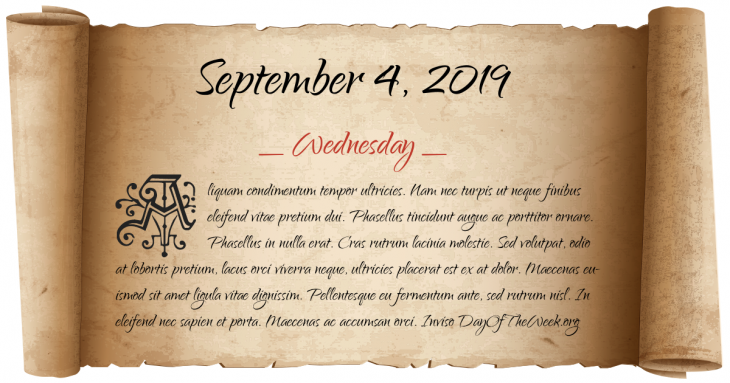 September 4, 2019 is the 247th day of the year 2019 in the Gregorian calendar. There are 118 days remaining until the end of the year. The day of the week is Wednesday. George Eastman registers the trademark Kodak and receives a patent for his camera that uses roll film. American Civil Rights Movement: Little Rock Crisis – Orval Faubus, governor of Arkansas, calls out the National Guard to prevent African American students from enrolling in Central High School. War on Drugs: Revolutionary Armed Forces of Colombia (FARC) attack a military base in Guaviare, starting three weeks of guerrilla warfare in which at least 130 Colombians are killed. Who were born on September 4? David Broza, a multi-platinum Israeli singer-songwriter and guitarist.